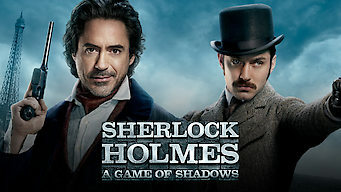 How to watch Sherlock Holmes: A Game of Shadows (2011) on Netflix Canada! Yes, Sherlock Holmes: A Game of Shadows is now available on Canadian Netflix. It arrived for online streaming on December 15, 2018. We'll keep checking Netflix Canada for Sherlock Holmes: A Game of Shadows, and this page will be updated with any changes. The sequel to 2009's Sherlock Holmes finds the brilliant sleuth resorting to occult theories to defeat the plans of the evil Professor Moriarty. He's always the smartest man in the room, but he may have finally met his match. It’s a mind game to the death!